Strategic Culling For Cost Control. Every attorney has a license to cull irrelevant data before beginning expensive linear review. It is part of their duty to protect their clients and country from waste and abuse. This article describes the two-filter culling method I’ve devised over the years to identify and bulk-code irrelevant documents. The method is designed for use before commencing a detailed attorney review. The efficacy of any large-scale document review project can be enhanced by this double-cull method. In my experience, it not only helps to reduce costs, it also maximizes recall, allowing an attorney to find all of the documents needed for a case quickly and efficiently. The two-filter culling method includes the well-known technology processes of deduplication and deNisting in the first filter. (Note: I always do full horizontal deduplication across all custodians.) Deduplication and deNisting are, however, just technical engineering filters, not based on legal analysis or judgment. They are well-established industry standards and so I will not discuss them further in this article. Many e-discovery beginners think that deNisting and deduplication are the end-all of ESI culling, but that is far from true. They are just the beginning. The other methods described here all require legal judgment, and so you cannot just hire an e-discovery vendor to do it, as you can with deduplication and deNisting. Legal judgment is critical to all effective document review, including culling of irrelevant documents before lawyers spend their valuable time in linear review. In my opinion, all legal review teams should employ some type of two-filter culling component. My thirty-five plus years of experience as a practicing lawyer have shown me that the most reliable way for the magic of justice to happen is by finding the key documents. You find the truth, the whole truth, and nothing but the truth, when you find the key documents needed to complete the picture of what happened and keep witnesses honest. In today’s information flooded world, that can only happen if we use technology in a strategic manner to find relevant evidence quickly and inexpensively. The two-filter method makes it easier to do that. This almost 10,000 word article provides an explanation of how to do it that is accessible to beginners and eLeet alike. This article contains a lengthy description of document culling, but still is not complete. My methods vary to adapt to the data and changing technologies. I share these methods to try to help all attorneys control the costs of document review and find the information needed to do justice. All too often these costs spiral out of control, or the review is done so poorly that key documents are not found. Both scenarios are obviously bad for our system of justice. We need cases to be decided on the merits, on the facts. Hopefully my writings can help make that happen in some small way. Hopefully a more tech-savvy Bar can stem the tide of over-settlement that we have seen in the profession since the explosion of data began in the nineties. All too often cases are now decided on the basis of settlement value, not merits. As it now stands, way too many frivolous cases are filed hoping there will be some kind of payout. These cases tend to drown out the few with merit. Judges are overwhelmed and often do not have the time needed to get down to the nitty-gritty details of the truth. Most of the time judges and juries are never given the chance to do their job. The cases all settle out instead. As a result only one percent of federal civil cases actually go to trial. This is a big loss for society, and for the “trial lawyers” in our profession, a group I once prided myself to be a part. Now I just focus on getting the facts from big data, to help keep the witnesses honest, and cases decided on the true facts, the evidence. Then I turn it over to the trial lawyers in my firm. They are then armed with the truth, the key documents, good or bad. The trial lawyers then put the best face possible on these facts, which hopefully is handsome to begin with. They argue how the law applies to these facts to seek a fair and just result for our clients. The disputed issues of fact are also argued, but based on the evaluation of the meaning of the key documents and the witness testimony. That is, in my opinion, how our system of justice is supposed to operate. It is certainly the way our legal system functioned when I learned to practice law and had my first trials back in 1980. Back then we only had a few thousand files to cull through to find the key documents, perhaps tens of thousands in a big case. Now we have hundreds of thousands of documents to cull through, millions in a big case. Still, even though the data volumes are far greater today, with the two-filter method described here, the few key documents needed to decide a case can be found. Big Data today presents an opportunity for lawyers. There are electronic writings everywhere and can be hard to destroy. 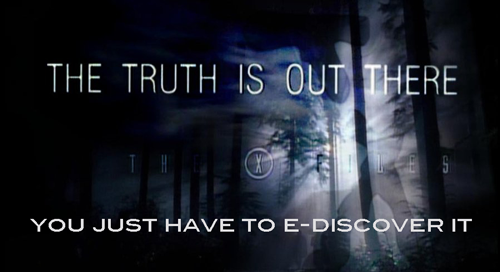 The large amount of ESI floating in cyberspace means that the truth is almost always out there. You just have to find it. There is so much data that it is much more likely for key documents to exist than ever before. The digital trails that people leave today are much bigger than the paper trails of old. The fact that more truth is out there than ever before gives tech-savvy lawyers a great advantage. They have a much better chance than lawyers in the past ever did to find the documents needed to keep witnesses honest, or put more politely, to help refresh their memory. The flood of information can in this way improve the quality of justice. It all depends on our ability to find the truth from the massive quantities of irrelevant information available. 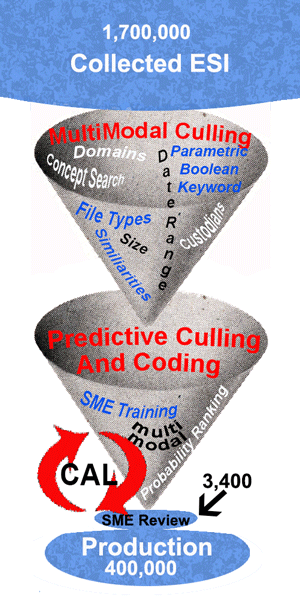 The more advanced culling methods described here, primarily the ones in the second filter that use predictive coding – AI-enhanced document ranking methods – are especially effective in culling the chaff from the wheat. They are especially effective in Big Data cases. I expect this kind of predictive analytics software to keep on improving. For that reason I am confident that we will continue to be able to find the core kernels of truth needed to do justice, no matter how much data we generate and save. The danger of missing evidence is magnified when the keywords are selected on the basis of educated guesses or just limited research. This technique, if you can call it that, is, sadly, still the dominant method used by lawyers today to come up with keywords. I have long thought it is equivalent to a child’s game of Go Fish. If keywords are dreamed up like that, as mere educated guesses, then keyword filtering is a high-risk method of culling out irrelevant data. There is a significant danger that it will exclude many important documents that do not happen to contain the selected keywords. No matter how good your predictive coding may be after that, you will never find these key documents. There are many other bulk coding techniques that can be used in the first filter stage. This is not intended to be an exhaustive search. Like all complex tasks in the law, simple black letter rules are for amateurs. The law, which mirrors the real world, does not work like that. The same holds true for legal search. There may be many Gilbert’s for search books and articles, but they are just 1L types. For true legal search professionals they are mere starting points. Use my culling advice here in the same manner. 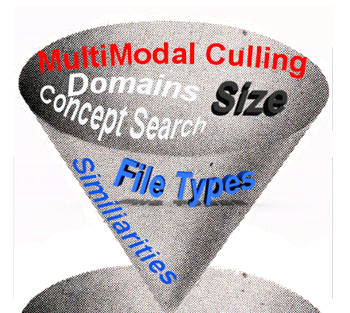 Use your own judgment to mix and match the right kind of culling tools for the particular case and data encountered. Every project is slightly different, even in the world of repeat litigation, like employment law disputes where I currently spend much of my time. Remember the goal is always efficiency, and caution, but not over-cautious. The more experienced you get the better you become at evaluating risks and knowing where you can safely take chances to bulk code, and where you cannot. Another thing to remember is that many image files have text in them too, such as in the metadata, or in ASCII transmissions. They are usually not important and do not provide good training for second stage predictive coding. The second filter begins where the first leaves off. The ESI has already been purged of unwanted custodians, date ranges, spam, and other obvious irrelevant files and file types. Think of the First Filter as a rough, coarse filter, and the Second Filter as fine-grained. The Second Filter requires a much deeper dive into file contents to cull out irrelevance. The most effective way to do that is to use predictive coding, by which I mean active machine learning, supplemented somewhat by using a variety of methods to find good training documents. That is what I call a multimodal approach that places primary reliance on the Artificial Intelligence at the top of the search pyramid. If you do not have active machine learning type of predictive coding with ranking abilities, you can still do fine-grained Second Level filtering, but it will be harder, and probably less effective and more expensive. All kinds of Second Filter search methods should be used to find highly relevant and relevant documents for AI training. Stay away from any process that uses just one search method, even if the one method is predictive ranking. Stay far away if the one method is rolling dice. Reliance on random chance alone has been proven to be an inefficient and ineffective way to select training documents. Latest Grossman and Cormack Study Proves Folly of Using Random Search For Machine Training – – Part One and Part Two and Three and Four. No one should be surprised by that. The first round of training begins with the documents reviewed and coded relevant incidental to the First Filter coding. You could also defer the first round until you have done more active searches for relevant and highly relevant from the pool remaining after First Filter culling. In that case you also include irrelevant in the first training round, which is also important. Note that even though the first round of training is the only round of training that has a special name – seed set – there is nothing all that important or special about it. All rounds of training are important. There is so much misunderstanding about that, and seed sets, that I no longer like to even use the term. The only thing special in my mind about the first round of training is that it is sometimes a very large training set. That happens when the First Filter turns up a large amount of relevant files, or they are otherwise known and coded before the Second Filter training begins. The sheer volume of training documents in many first rounds thus makes them special, not the fact that the training came first. No good predictive coding software is going to give special significance to a training document just because it came first in time. (It might if it uses a control set, but that is a different story, which I will probably explain in next month’s blog.) The software I use has no trouble at all disregarding any early training if it later finds that it is inconsistent with the total training input. It is, admittedly, somewhat aggravating to have a machine tell you that your earlier coding was wrong. But I would rather have an emotionless machine tell me that, than another gloating attorney (or judge), especially when the computer is correct, which is often (not always) the case. That is, after all, the whole point of using good software with artificial intelligence. You do that to enhance your own abilities. There is no way I could attain the level of recall I have been able to manage lately in large document review projects by reliance on my own, limited intelligence alone. That is another one of my search and review secrets. Get help from a higher intelligence, even if you have to create it yourself by following proper training protocols. Maybe someday the AI will come prepackaged, and not require training, or at least very little training. I know it can be done, especially if other data analytics techniques are used. I am working on this project now. See PreSuit.com. In addition to technical issues, there are serious ethical concerns as well, including especially employee privacy concerns. Should Lawyers Be Big Data Cops? The implications on the law of predictive misconduct are tremendous. I am now focusing my time and resources accordingly. Information governance in general is something that concerns me, and is another reason I hold back on Presuit. Hadoop, Data Lakes, Predictive Analytics and the Ultimate Demise of Information Governance – Part One and Part Two. Also see: e-Discovery Industry Reaction to Microsoft’s Offer to Purchase Equivio for $200 Million – Part Two. I do not want my information governed by a State of Big Brother, even assuming that’s possible. I want it secured, protected, and findable, but only by me, unless I give my express written assent (no contracts of adhesion permitted). By the way, even though I am cautious, I see no problem in requiring that consent as a condition of employment, so long as it is reasonable in scope and limited to only business communications. I am wary of Big Brother emerging from Big Data. You should be too. I want AIs under our own individual control where they each have a real big off switch. That is the way it is now with legal search and I want it to stay that way. I want the AIs to remain under my control, not visa versa. Not only that, like all Europeans, I want a right to be forgotten by AIs and humans alike. But wait, there’s still more to my vision of a free future, one where the ideals of freedom and liberty triumph. I want AIs smart enough to protect individuals from governments, all governments, including the Obama administration. His DOJ has continued the disgraceful acts of the Bush Administration to ignore the Constitutional prohibition against General Warrants. See: Fourth Amendment to the U.S. Constitution. Now that Judge Facciola has retired, who on the federal D.C. bench is brave enough to protect us? See: Judge John Facciola Exposes Justice Department’s Unconstitutional Search and Seizure of Personal Email. Perhaps quantum entanglement encryption is the ultimate solution? See eg. Entangled Photons on Silicon Chip: Secure Communications & Ultrafast Computers, The Hacker News, 1/27/15. Truth is far stranger than fiction. Quantum Physics may seem irrational, but it has repeatedly been proven true. The fact that it may seem irrational for two electrons to interact instantly over any distance just means that our sense of reason is not keeping up. There may soon be spooky ways for private communications to be forever private. At the same time that I want unentangled freedom and privacy, I want a government that can protect us from crooks, crazies, foreign governments, and black hats. I just do not want to give up my Constitutional rights to receive that protection. We should not have to trade privacy for security. That is a false choice. Once we lay down our Constitutional rights in the name of security, the terrorists have already won. Getting back to legal search, and how to find out what you need to know inside the law by using the latest AI-enhanced search methods, there are three kinds of probability ranked search engines now in use for predictive coding. After the first round of training (really after the first document is coded in software with continuous active training), you can begin to harness the AI features in your software. You can begin to use its probability ranking to find relevant documents. There are currently three kinds of ranking search and review strategies in use: uncertainty, high probability, and random. The uncertainty search, sometimes called SAL for Simple Active Learning, looks at middle ranking documents where the code is unsure of relevance, typically the 40%-60% range. The high probability search looks at documents where the AI thinks it knows about whether documents are relevant or irrelevant. You can also use some random searches, if you want, both simple and judgmental, just be careful not to rely too much on chance. The 2014 Cormack Grossman comparative study of various methods has shown that the high probability search, which they called CAL, for Continuous Active Learning using high ranking documents, is very effective. Evaluation of Machine-Learning Protocols for Technology-Assisted Review in Electronic Discovery, SIGIR’14, July 6–11, 2014. Also see: Latest Grossman and Cormack Study Proves Folly of Using Random Search For Machine Training – Part Two. My own experience also confirms their experiments. 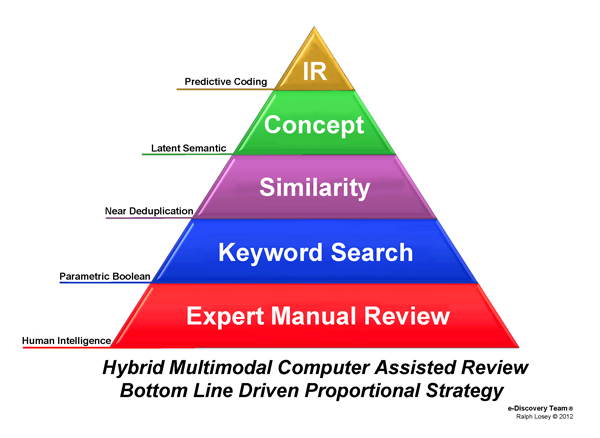 High probability searches usually involve SME training and review of the upper strata, the documents with a 90% or higher probability of relevance. The exact percentage depends on the number of documents involved. I may also check out the low strata, but will not spend very much time on that end. I like to use both uncertainty and high probability searches, but typically with a strong emphasis on the high probability searches. And again, I supplement these ranking searches with other multimodal methods, especially when I encounter strong, new, or highly relevant type documents. Sometimes I will even use a little random sampling, but the mentioned Cormack Grossman study shows that it is not effective, especially on its own. They call such chance-based search Simple Passive Learning, or SPL. Ever since reading the Cormack Grossman study I have cut back on my reliance on any random searches. You should too. It was small before, it is even smaller now. This does not mean sampling does not still have a place in documents review. It does, but in quality control, not in selection of training documents. See eg. ZeroErrorNumerics.com and Introducing “ei-Recall” – A New Gold Standard for Recall Calculations in Legal Search. Of course, if you have culled out a document altogether in the First Filter, you do not need to code it, because these documents will not be part of the documents included in the Second Filter. In other words, they will not be among the documents ranked in predictive coding. The will either be excluded from possible production altogether as irrelevant, or will be diverted to a non-predictive coding track for final determinations. The later is the case for non-text file types like graphics and audio in cases where they might have relevant information. When you have software with active machine learning features that allow you to do predictive ranking, then you find documents for training, and from that point forward you incorporate ranking searches into your review. If you do not have such features, you still sort out documents in the Second Filter for manual review, you just do not use ranking with SAL and CAL to do so. Instead, you rely on keyword selections, enhanced with concept searches and similarity searches. When you find an effective parametric Boolean keyword combination, which is done by a process of party negotiation, then testing, educated guessing, trial and error, and judgmental sampling, then you submit the documents containing proven hits to full manual review. Ranking by keywords can also be tried for document batching, but be careful of large files having many keyword hits just on the basis of file size, not relevance. Some software compensates for that, but most do not. So ranking by keywords can be a risky process. I am not going to go into detail on the old-fashioned ways of batching out documents for manual review. Most e-discovery lawyers already have a good idea of how to do that. So too do most vendors. Just one word of advice. When you start the manual review based on keyword or other non-predictive coding processes, check in daily with the contract reviewer work and calculate what kind of precision the various keyword and other assignment folders are creating. If it is terrible, which I would say is less than 50% precision, then I suggest you try to improve the selection matrix. Change the Boolean, or key words, or something. Do not just keep plodding ahead and wasting client money. I once took over a review project that was using negotiated, then tested and modified keywords. After two days of manual review we realized that only 2% of the documents selected for review by this method were relevant. After I came in and spent three days with training to add predictive ranking we were able to increase that to 80% precision. If you use these multimodal methods, you can expect similar results. Whether you use predictive ranking or not, the basic idea behind the two filter method is to start with a very large pool of documents, reduce the size by a coarse First Filter, then reduce it again by a much finer Second Filter. The result should be a much, much small pool that is human reviewed, and an even smaller pool that is actually produced or logged. Of course, some of the documents subject to the final human review may be overturned, that is, found to be irrelevant, False Positives. That means they will not make it to the very bottom production pool after manual review in the diagram right. 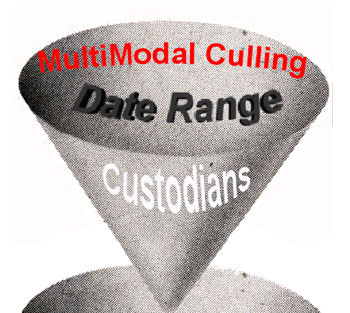 In multimodal projects where predictive coding is used the precision rates can often be very high. Lately I have been seeing that the second pool of documents, subject to the manual review has precision rates of at least 80%, sometimes even as high as 95% near the end of a CAL project. That means the final pool of documents produced is almost as large as the pool after the Second Filter. Please remember that almost every document that is manually reviewed and coded after the Second Filter gets recycled back into the machine training process. This is known as Continuous Active Learning or CAL, and in my version of it at least, is multimodal and not limited to only high probability ranking searches. See: Latest Grossman and Cormack Study Proves Folly of Using Random Search For Machine Training– Part Two. In some projects you may just train for multiple iterations and then stop training and transition to pure manual review, but in most you will want to continue training as you do manual review. Thus you set up a CAL constant feedback loop until you are done, or nearly done, with manual review. As mentioned, active machine learning trains on both relevance and irrelevance. Although, in my opinion, the documents found that are Highly Relevant, the hot documents, are the most important of all for training purposes. The idea is to use predictive coding to segregate your data into two separate camps, relevant and irrelevant. You not only separate them, but you also rank them according to probable relevance. The software I normally use, Kroll Ontrack’s EDR, has a percentage system from .01% to 99.9% probable relevant and visa versa. A very good segregation-ranking project should end up looking like an upside down champagne glass. The above is a screen shot from a recent project I did after training was complete. This project had about a 4% prevalence of relevant documents, so it made sense for the relevant half to be far smaller. 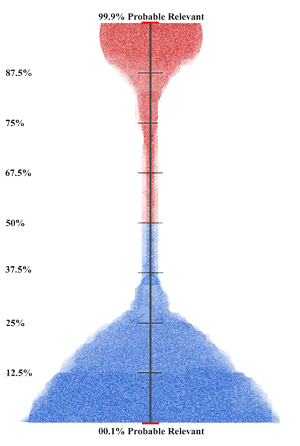 But what is striking about the data stratification is how polarized the groupings are. This means the ranking distribution separation, relevant and irrelevant, is very well formed. There are an extremely small number of documents where the AI is unsure of classification. The slow curving shape of irrelevant probability on the left (or the bottom of my upside down champagne glass) is gone. The visualization shows a much clearer and complete ranking at work. The AI is much more certain about what documents are irrelevant. To the right is a screenshot of the table form display of this same project in 5% increments. It shows the exact numerics of the probability distribution in place when the machine training was completed. This is the most pronounced polar separation I have ever seen, which shows that my training on relevancy has been well understood by the machine. After you have segregated the document collection into two groups, and gone as far as you can, or as far as your budget allows, then you cull out the probable irrelevant. The most logical place for the Second Filter cut-off point in most projects in the 49.9% and less probable relevant. They are the documents that are more likely than not to be irrelevant. But do not take the 50% plus dividing line as an absolute rule in every case. There are no hard and fast rules to predictive culling. In some cases you may have to cut off at 90% probable relevant. Much depends on the overall distribution of the rankings and the proportionality constraints of the case. Like I said before, if you are looking for Gilbert’s black-letter law solutions to legal search, you are in the wrong type of law. documents will have been reviewed too. That is all part of the CAL process where both relevant and irrelevant documents are used in training. If all goes well, however, only a few of the very low percentage probable relevant documents will be reviewed. In some cases you can, with client permission (often insistence), dispense with attorney review of all or near all of the documents in the upper half. You might, for instance, stop after the manual review has attained a well-defined and stable ranking structure. You might, for instance, only have reviewed 10% of the probable relevant documents (top half of the diagram), but decide to produce the other 90% of the probable relevant documents without attorney eyes ever looking at them. There are, of course, obvious problems with privilege and confidentiality to such a strategy. Still, in some cases, where appropriate clawback and other confidentiality orders are in place, the client may want to risk disclosure of secrets to save the costs of final manual review. In such productions there are also dangers of imprecision where a significant percentage of irrelevant documents are included. This in turn raises concerns that an adversarial view of the other documents could engender other suits, even if there is some agreement for return of irrelevant. Once the bell has been rung, privileged or hot, it cannot be un-rung. In spite of the dangers of the unringable bell, the allure of extreme cost savings can be strong to some clients in some cases. For instance, I did one experiment using multimodal CAL with no final review at all, where I still attained fairly high recall, and the cost per document was only seven cents. I did all of the review myself acting as the sole SME. The visualization of this project would look like the below figure. Note that if the SME review pool were drawn to scale according to number of documents read, then, in most cases, it would be much smaller than shown. In the review where I brought the cost down to $0.07 per document I started with a document pool of about 1.7 Million, and ended with a production of about 400,000. The SME review pool in the middle was only 3,400 documents. As far as legal search projects go it was an unusually high prevalence, and thus the production of 400,000 documents was very large. Four hundred thousand was the number of documents ranked with a 50% or higher probable prevalence when I stopped the training. I only personally reviewed about 3,400 documents during the SME review. I then went on to review another 1,745 documents after I decided to stop training, but did so only for quality assurance purposes and using a random sample. To be clear, I worked alone, and no one other than me reviewed any documents. This was an Army of One type project. Although I only personally reviewed 3,400 documents for training, I actually instructed the machine to train on many more documents than that. I just selected them for training without actually reviewing them first. I did so on the basis of ranking and judgmental sampling of the ranked categories. It was somewhat risky, but it did speed up the process considerably, and in the end worked out very well. I later found out that other information scientists often use this technique as well. See eg.Evaluation of Machine-Learning Protocols for Technology-Assisted Review in Electronic Discovery, SIGIR’14, July 6–11, 2014, at pg. 9. My goal in this project was recall, not precision, nor even F1, and I was careful not to over-train on irrelevance. The requesting party was much more concerned with recall than precision, especially since the relevancy standard here was so loose. (Precision was still important, and was attained too. Indeed, there were no complaints about that.) In situations like that the slight over-inclusion of relevant training documents is not terribly risky, especially if you check out your decisions with careful judgmental sampling, and quasi-random sampling. I accomplished this review in two weeks, spending 65 hours on the project. Interestingly, my time broke down into 46 hours of actual document review time, plus another 19 hours of analysis. Yes, about one hour of thinking and measuring for every two and a half hours of review. If you want the secret of my success, that is it. I stopped after 65 hours, and two weeks of calendar time, primarily because I ran out of time. I had a deadline to meet and I met it. I am not sure how much longer I would have had to continue the training before the training fully stabilized in the traditional sense. I doubt it would have been more than another two or three rounds; four or five more rounds at most. Typically I have the luxury to keep training in a large project like this until I no longer find any significant new relevant document types, and do not see any significant changes in document rankings. I did not think at the time that my culling out of irrelevant documents had been ideal, but I was confident it was good, and certainly reasonable. (I had not yet uncovered my ideal upside down champagne glass shape visualization.) I saw a slow down in probability shifts, and thought I was close to the end. The sampling I did after the decision to stop suggested that I had exceeded my recall goals, but still, the project was much more rushed than I would have liked. I was also comforted by the fact that the elusion sample test at the end passed my accept on zero error quality assurance test. I did not find any hot documents. For those reasons (plus great weariness with the whole project), I decided not to pull some all-nighters to run a few more rounds of training. Instead, I went ahead and completed my report, added graphics and more analysis, and made my production with a few hours to spare. 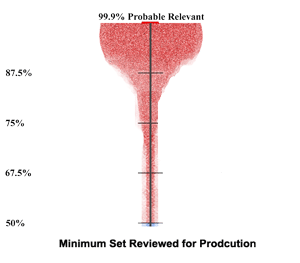 A scientist hired after the production did some post-hoc testing that confirmed an approximate 95% confidence level recall achievement of between 83% to 94%. My work also confirmed all subsequent challenges. I am not at liberty to disclose further details. In post hoc analysis I found that the probability distribution was close to the ideal shape that I now know to look for. The below diagram represents an approximate depiction of the ranking distribution of the 1.7 Million documents at the end of the project. The 400,000 documents produced (obviously I am rounding off all these numbers) were 50% plus, and 1,300,000 not produced were less than 50%. Of the 1,300,000 Negatives, 480,000 documents were ranked with only 1% or less probable relevance. On the other end, the high side, 245,000 documents had a probable relevance ranking of 99% or more. There were another 155,000 documents with a ranking between 99% and 50% probable relevant. Finally, there were 820,000 documents ranked between 49% and 01% probable relevant. The client here was comfortable with reliance on confidentiality agreements for reasons that I cannot disclose. In most cases litigants are not, and insist on eyes on review of every document produced. I well understand this, and in today’s harsh world of hard ball litigation it is usually prudent to do so, clawback or no. Another reason the review was so cheap and fast in this project is because there were very little opposing counsel transactional costs involved, and everyone was hands off. I just did my thing, on my own, and with no interference. I did not have to talk to anybody; just read a few guidance memorandums. My task was to find the relevant documents, make the production, and prepare a detailed report – 41 pages, including diagrams – that described my review. Someone else prepared a privilege log for the 2,500 documents withheld on the basis of privilege. I am proud of what I was able to accomplish with the two-filter multimodal methods, especially as it was subject to the mentioned post-review analysis and recall validation. But, as mentioned, I would not want to do it again. Working alone like that was very challenging and demanding. Further, it was only possible at all because I happened to be a subject matter expert of the type of legal dispute involved. There are only a few fields where I am competent to act alone as an SME. Moreover, virtually no legal SMEs are also experienced ESI searchers and software power users. In fact, most legal SMEs are technophobes. I have even had to print out key documents to paper to work with some of them. Even if I have adequate SME abilities on a legal dispute, I now prefer to do a small team approach, rather than a solo approach. I now prefer to have one of two attorneys assisting me on the document reading, and a couple more assisting me as SMEs. In fact, I can act as the conductor of a predictive coding project where I have very little or no subject matter expertise at all. That is not uncommon. I just work as the software and methodology expert; the Experienced Searcher. Recently I worked on a project where I did not even speak the language used in most of the documents. I could not read most of them, even if I tried. I just worked on procedure and numbers alone. Others on the team got their hands in the digital mud and reported to me and the SMEs. This works fine if you have good bilingual SMEs and contract reviewers doing most of the hands-on work. There is much more to efficient, effective review than just using software with predictive coding features. The methodology of how you do the review is critical. The two filter method described here has been used for years to cull away irrelevant documents before manual review, but it has typically just been used with keywords. I have shown in this article how this method can be employed in a multimodal manner that includes predictive coding in the Second Filter. Keywords can be an effective method to both cull out presumptively irrelevant files, and cull in presumptively relevant, but keywords are only one method, among many. In most projects it is not even the most effective method. 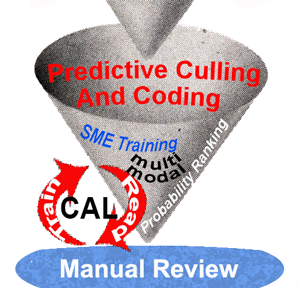 AI-enhanced review with predictive coding is usually a much more powerful method to cull out the irrelevant and cull in the relevant and highly relevant. If you are using a one-filter method, where you just do a rough cut and filter out by keywords, date, and custodians, and then manually review the rest, you are reviewing too much. It is especially ineffective when you collect based on keywords. As shown in Biomet, that can doom you to low recall, no matter how good your later predictive coding may be. If you are using a two-filter method, but are not using predictive coding in the second filter, you are still reviewing too much. The two-filter method is far more effective when you use relevance probability ranking to cull out documents from final manual review. READING ASSIGNMENT: This is a long class, but if you want to do more, take a look at Losey’s LegalSearchScience.com, and Computer Assisted Review websites. What did you find the most interesting points in these pages? Do you think robots will someday replace lawyers? Why or why not? After you reach your own opinions, Google what Losey has said about this. EXERCISE: Culling can be a tremendous cost and time saver. Can you figure out a GB range as to what a 10 GB PST file would normally cull down to before any human directed search begins? How many documents would an attorney typically have to review under the 10 GB PST file scenario? Ask some vendors these questions. Until recently most vendors did not like to talk about advance culling. Cab you guess why? Any idea on why this is changing now? 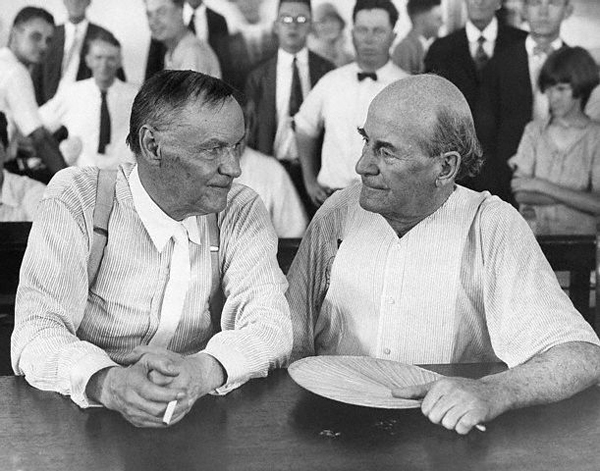 Discretionary Bonus Exercise: This really has nothing to do with this class, but find out which famous federal judge lectured in Second Life, the subject of their presentation, and the surprise ending. It’s pretty cool. You must check out the Second Life appearance of the judge. It is pretty funny and nice to know that judges do have great sense of humor!! Recent ruling in S.D.N.Y. by Judge Andrew J. Peck regarding Computer-Assisted Review: Da Silva Moore v. Publicis Groupe, S.D.N.Y. Feb. 24, 2012.